Design Concept: : Generally, people just need to fully charge their phones once in a day. OISLE's design conception is to find a perfect balance between practicability and exquisiteness, and with the best quality. 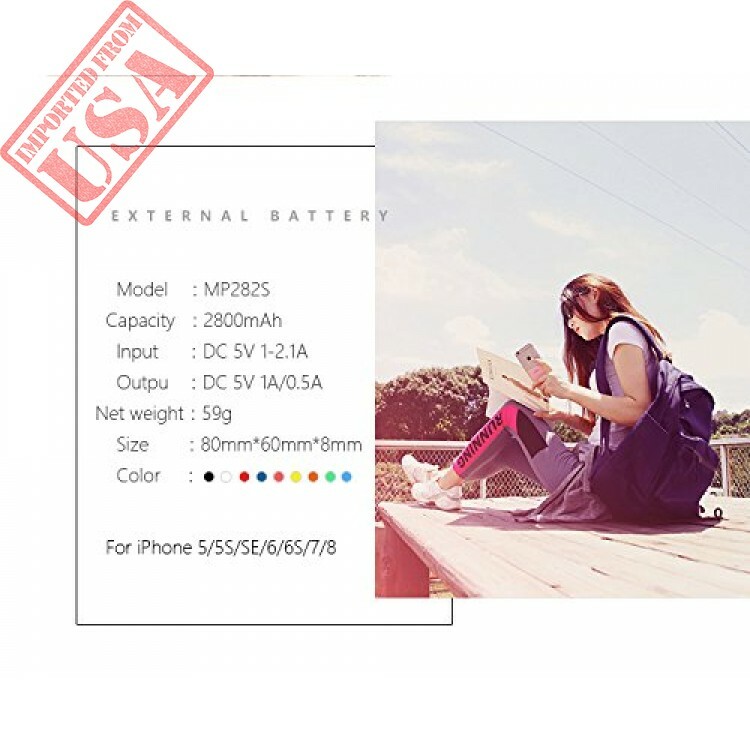 TOP FEATURES: - Li-Polymer Battery - LED Battery Level Indicator - Universal Apple Compatibility - Easy to Use PARAMETER: -Input: DC 5V/1-2A -Output: DC 5V/1A MAX -Capacity: 2800mAh -Weight:59g -Size:2.28 x 3.15 x 0.3in -Certificate: CE, FCC & RoHS -Charging mode : slow/quick (press function button for 3sec to switch) NOTE: The capacity is 2800 mAh. Dear supporters, please think it through before purchasing, the portability is inversely proportional to the capacity, and it's not available to get them simultaneously. We will do as perfect as possible. USB charging cable is not included, you can use your iPhone lightening cable to charge it. 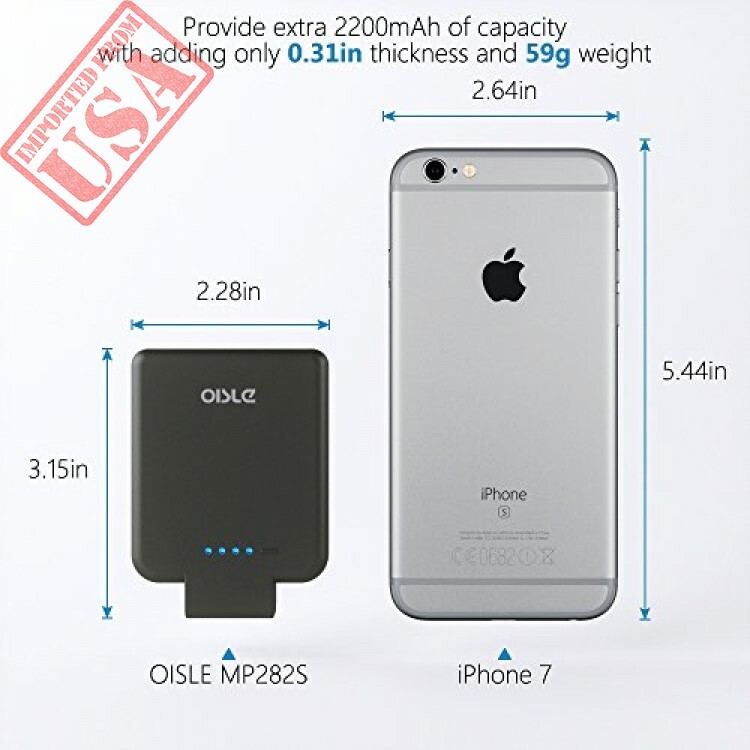 Compatible with: iPhone 7, iPhone 6/ 6S, iPhone 5/5S. 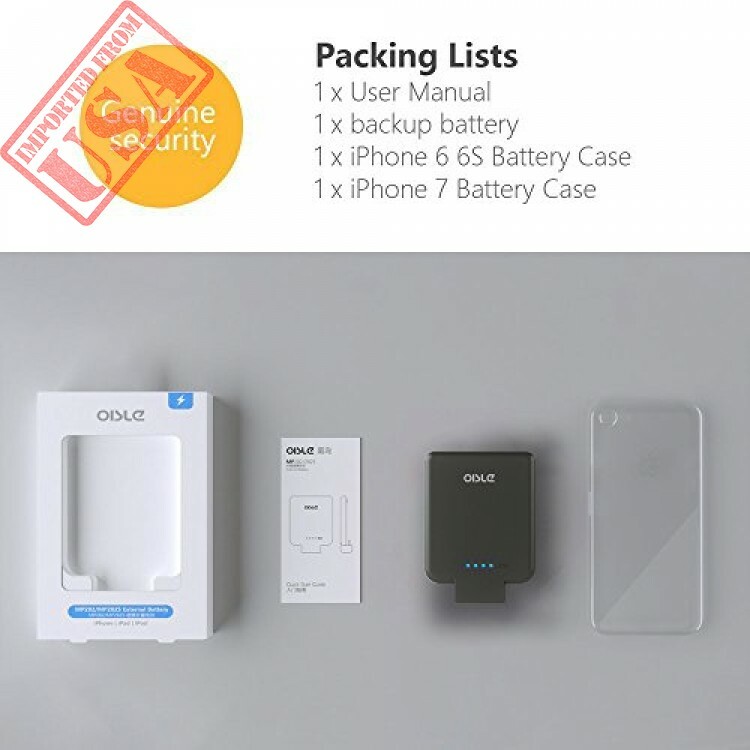 INSTRUCTIONS: -Automatically charge with slow charge mode(default mode) -Press ON/OFF button 3 seconds to start QUICKER charge BOX CONTENT: -1 x backup battery -1 x iPhone 6 6S Battery Case -1 x iPhone 7 Battery Case -1 x User Manual OISLE Manufacturer Warranty: OISLE offers a 1-year manufacturer limited warranty that will protect you against all defects in material and workmanship. 1, Please do not bend the lightning port of the Mini Power Bank. It is very easy to bend. Please take care of it. 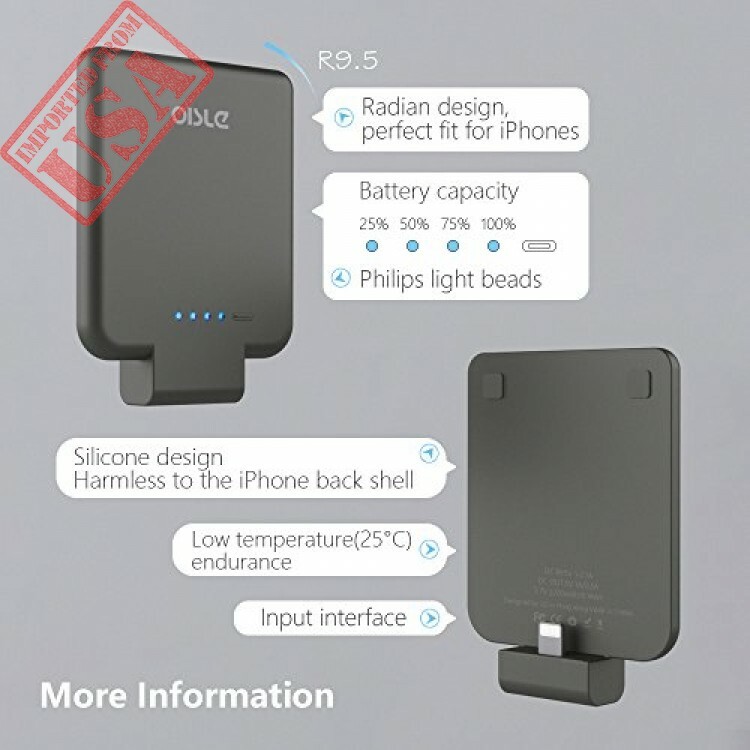 2, Generally speaking, the Mini Power Bank can not used in the iPhone case's thickness > 1mm. Only fit for the cell phone case < 1mm. 3, Please insert & pull the Mini Power Bank in Horizontal line with iPhone. Ultra-Thin & Super Light ★- Only 0.28inch Thickness, 51g Weight. The new design Power Bank make you almost no feeling in charging. OISLE's Design of Power Bank ★ - We always develop the new conception & useful power banks. Compatible with iPhone X/8(P)/7(P)/ 6(P) / 6s /5s /5. 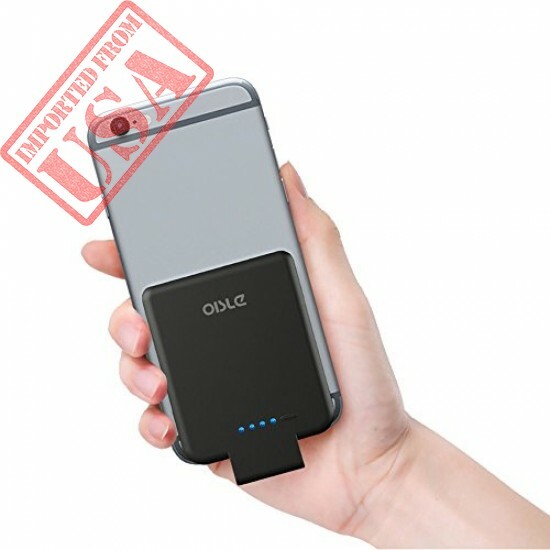 No Cable needed in Charging ★- More convenient than before, no need cable to connect Power bank and Iphone. No need to buy additional Micro USB cables. You can use your existing lightning cables to charge the battery case and your iPhone simultaneously. Quicker Charge Smart & LED Battery Level Indicator ★- Press to start normal charge, holding 3 seconds to start QUICKER charge. Quality Assurance★- We have CE, FCC, RoHS certificated, and the UL certificated still in processing to promise the good quality and protect the safe using. 100% customer satisfaction, 40 days money back with One Year warranty.